New Zealand’s mountain areas are sparsely populated, and the direct impact of disasters in these areas is largely on agricultural communities and communication networks. Subject to earthquakes (mainly in the Southern Alps) and volcanic eruptions (on the Central Plateau of North Island) New Zealand’s mountain areas are more generally subject to problems of erosion and land slips and in the south, irregular, extreme snow falls. The impact of exceptionally heavy snow falls over the past 150 years of European settlement is relatively well documented. While modern technology might be thought to have lessened such impacts, the recent snowstorm of 2006 in South Canterbury highlights how such hazardous events continue to impact on communities in mountain and upland areas. The increased dependence on modern communication technologies and changes in the operation and management of modern farm systems are shown to compound the social and economic impact of such events. This impact is significantly modified by the size and structure of the farms concerned. 1Exceptionally severe snowstorms can and do pose a serious hazard to people in New Zealand’s upland and mountain areas (Burrows, 1976). Two-thirds of the country is steep or mountainous and over 75% of the land area is above 200 m. New Zealand’s history and cultural heritage have contributed to patterns of settlement and land use in these areas that are very different to comparable Alpine areas in Europe (Jeanneret et al., 2001). The population in New Zealand’s mountains is small and widely scattered. Settlements are few, and the road network is thin. 2European settlement resulted in the establishment of large pastoral farms (runs). In the High Country, typically defined as land over 700 m and broadly equated with the Alpine zone in Europe (Swaffield and Hughey, 2001) such runs remain today. Over time in more lowland areas these have been subdivided and land use intensified. This legacy impacts on current community structures and farm systems. 3This paper examines the impact on farms and farm households of the snowstorm which swept Canterbury in June, 2006. Worst hit was South Canterbury (Figure 1). The region stretches west and inland from the coastal flats and foothills (which reach heights of over 2,300 m) to the Mackenzie Country, an intermontane basin at 700-800 m and the Southern Alps which rise several thousand metres higher. In the foothills, farms typically average between 180 and 500 hectares. In the mountains, runs can exceed 10,000 hectares, although stocking densities may be as low as one per hectare (Metherell, 1997). Despite low stocking rates, such properties can generate substantial incomes and this, reinforced by their history and lifestyle, has long been viewed as granting runholders an element of social distinction which in large part they still retain (Hatch, 1992). The research addressed the full range of farm types. 4The iterative approach adopted was based on grounded theory (Glaser and Strauss, 1967) involving detailed interviews, data collection and triangulation to reflect the lived experiences of those directly involved in the event, and validate findings. Sampling, in line with grounded theory, was not statistically based, but determined by the relevance of the sample to the scope of the work. Thirty-two semi-structured interviews were carried-out with farm households; seven with Civil Defence officials and others involved in the relief effort. Interviews were backed by an analysis of newspapers and other published materials. The interviews were conducted in February-April, 2007 (Smith, 2007) and allowed the collection of primary information to assess farmers’ perception of the storm, its impact and their household and community response. 5Of the sample farms, 7 were in the High Country (or Alpine zone), 12 in the foothills, and 13 on the coastal plains. Sheep farming dominates the region. However, all those interviewed also grew some proportion of their own winter feed. In the High Country and foothills, sheep were frequently raised in association with deer and beef. On the plains, farms were more diverse; 6 were dairy farms, two raised pigs, and cropping was both more intensive and more important than elsewhere. 6Snow began falling on the night of 11 June and continued into the morning of the 12 June. Forecast to reach down to 500 m, snow accumulated to 30 cm, even at sea level and commonly exceeded 70 cm towards the foothills. In the Mackenzie Basin, snow depths decreased closer to 40-50 cm (Hendrikx, 2007). 7The storm caused considerable damage to electricity distribution systems and resulted in the failure of phone services and other forms of electronic communication. In some areas electricity and phones remained out of action for more than three weeks (Wilson et al., 2009). Most major roads were cleared and reopened after two or three days. Side roads remained blocked for over a week. Farmers who had suitable equipment often assisted in clearing the back roads. But many roads were only partially cleared and farmers complained of access from their driveways being blocked by snow deposited as major roads were cleared. 8The snow created significant extra work for farmers. The immediate task was to check on stock. For those with sheep trapped in the snow, this involved up to a week of “snow raking” (digging sheep out of snow drifts), a demanding task. Elsewhere stock were rescued using four wheel drive tractors and brought to where feeding-out would be easier. Because of the depth of the snow and the need to wear cumbersome, heavy clothing this was still exhausting and time consuming. Diesel froze and there were frequent equipment failures. Short winter daylight hours left farmers with little time to tackle other tasks. In terms of insurance payouts the snowstorm is thought to have been the most expensive of recent decades (Hendrikx, 2007). 9June 2006 was the coldest in over 50 years, and frosts froze the snow so that it remained in some parts for up to seven weeks (Wilson et al., 2009). Coupled with the threat of another storm, this took a psychological and physical toll on farmers as they toiled day after day in freezing conditions leaving many at their wits’ end. Some: “…questioned whether farming was the right profession” (Sheep/deer farmer). 10Despite lobbying by farm groups, Civil Defence never declared an official state of emergency. Some argued this would have increased the level of government aid, allowed the greater use of military resources, and generated a faster government response. Civil Defence, however, believe that such a declaration would have made no difference (Interview, Civil Defence Official, Timaru, April 18, 2007). This highlights a political dimension of the relief effort that drew-in the Prime Minister, farm associations, and even the military in debate on the assistance provided (New Zealand Herald, 2006), echoing the politicisation of disaster management identified elsewhere (e.g. Bankoff, 2002). 11The impact of the storm was severe and long-lasting. All but one of the farmers interviewed acknowledged that the snow “put them back a bit” financially and psychologically. Fifty-percent (16/32) acknowledged that the snow had generated significant stress often compounded by financial concerns; only 1 of these farmers was in the High Country. The cumulative effects of damage to farms and farm equipment, coupled with the flow-on effects from delayed maintenance and upgrading also meant that farmers were unable to take a break between seasons. Lack of “time-out” and the other impacts of the snow exposed the vulnerability of many farms and farm households. 12Nine months after the snowstorm farmers reflected that it had been “not too traumatic” and believed they had recovered reasonably well. However, the loss of stock condition and lower breeding rates, as well as additional costs generated by the storm meant that most (22/32) faced on-going financial costs. Contrary to Civil Defence and other officials directly involved in the recovery effort, farmers believed that they had been prepared for a snowstorm. This they attributed to experience and their awareness of the risk of snow. Most of those interviewed (30/32) had experienced at least one previous hazard, including the major snows of 1992, 1973, 1967, as well as floods, droughts, rabbits, and hail. Most farmers indeed had made some conscious preparation for snow (29/32). Most had four-wheel drive tractors, shelter belts and a policy of going into winter with a store of stock feed of between 1½ to 2½ times an average winter’s needs. Some farmers had an attachment for their tractor to help clear the snow (14/32) and a few (3/32) had bulldozers. All had some level of insurance coverage. 13All surveyed households had log burning stoves most of which also heated their water. Most too had a wood stove for cooking, a gas barbecue, candles, torches, batteries, camping gear and enough food for one to two weeks. Log burners (especially those that could be used for cooking) and stoves that also heated the water were widely described as indispensable. Most households survived reasonably comfortably. 14Those least prepared suffered most and were mainly farms on the plains. This confirms the findings of other studies (Smith et al., 2011). Importantly, they were also less accustomed to snow. They also had fewer resources, less resident labour and less necessary equipment. Access to resources has repeatedly been shown as fundamental to coping in adversity (e.g. Blaikie et al., 1994). Closer to town such households frequently had one household member whose primary employment was off the farm (8/13), and had adapted to the convenience shopping associated with urban living, perhaps even buying bread on a daily basis. This contrasts with life on these same farms just a generation previous when transport links were much more difficult. 15The loss of power for up to two weeks in some areas caused electric fences to fail and allowed cattle to mob. In much of the study area, power cuts occur for a few days, most winters. But farmers were ill prepared for cuts of such long duration. Of those interviewed some (19/32) had generator back-up. But commonly this only provided power for domestic use, for maintaining a water pump or a freezer. From a business perspective, dairy or pig farmers faced serious management problems with a cut of more than 24-48 hours. There was indeed no one critical threshold, as the impact of an outage varied with the nature of the farm system. Invariably, the power outage was cause of annoyance; it was not, however, the worst impact of the snow. 16There was unanimity that the single greatest problem was enforced isolation. This was partly due to road closures, but particularly as a result of the loss of cellular phone coverage. The region as a whole lost land lines for between three and seven days. Cell phone coverage was out for up to 14 days following the failure of transmitting stations. There was a broad consensus that while households could cope with the power cuts lasting a few days, and that a couple of days isolation because of road closures were tolerable, prolonged lack of phone communications was unacceptable. 17In the immediate aftermath of the storm, the loss of phone services reduced the ability to check on extended family, neighbours, and friends. This increased the sense of isolation. Safety issues were also a concern. Farmers related how they or their neighbour while using their tractor had slipped into snow-covered ditches or gullies. Without phones there was little chance of medical help. Because of the terrain, cell phone reception is patchy at best, but farmers with reasonable reception on their properties routinely carry one as a safety measure. When partners did not return from snow raking when expected and there was no way to make contact, families worried. When cell phone coverage was re-established, phones remained useless until power was restored and phone batteries charged. 18The timing of the snowstorm 12 June meant that lambing and calving had not started. Had it occurred later in the winter, stock losses would have been high. In 2006, a dry summer and autumn, however, meant that winter feed supplies were being used as early as February. In consequence many farms already had low feed stocks when winter started and the storm hit. As a result, there was widespread agreement among farmers and government officials that a second snowstorm would have caused devastating stock losses as by then feed stocks would have been run down or exhausted and animals in poor condition. 19In most areas, farmers had checked on their neighbours by the afternoon of 12 June however physical help was often initially limited as farmers addressed their own immediate needs. Over the following days, spare camping gear and barbecues were lent and meals and hot showers offered to those in need. Much of this assistance came from other farmers and family members, but contractors, farm employees, farm suppliers and different service organisations, including the Red Cross, all offered assistance. This included visits, help with snow raking and feeding out, the loan of machinery, clearing roads and trees, the removal of dead stock, babysitting, cooking meals and washing clothes, and the provision of food parcels. Generators were also moved around to charge freezers. This response reinforces the views recurrent in other research, of the importance of social capital in hazard mitigation and the need for public involvement in disaster planning and recovery (see, for example, Pearce, 2003). Farmers acknowledged that they were overwhelmed by the support received, but also noted that in a way they expected it, as “that is the kind of community we have here” (Intensive sheep farmer). Mutual assistance also renewed community spirit. This was unanimously described as a powerful positive outcome of the storm. And confirmed the importance of neighbours and community members as the most immediate help in a crisis; a viewpoint routinely identified in advisory material concerning adverse events, including that designed for the rural population (Civil Defence Canterbury, undated). Community self-help reinforced farmers’ own self-image as rugged, independent, individuals, often cynical and dismissive of official assistance, especially where that might be construed as a “hand-out”. As one sheep/beef farmer put it: “farms are just like any other business. Farmers need to practise risk management and be self-sufficient”. 20In practice, over time an increasing amount of official assistance was required and provided. Farmers’ asserted claims of self-reliance did not necessarily lessen their expectation of assistance and many farmers later complained bitterly at the level of assistance provided. 21Initial official assistance, coordinated through Civil Defence, was severely hampered by the collapse of the communications network. Some of its own staff couldn’t get to work because of blocked roads, and there were problems of coordination and delays in determining the scale and level of need (Wilson et al., 2009). Two years later, lessons learned resulted in better co-ordination between Civil Defence and four-wheel drive clubs, and improvements to volunteer training (Otago Daily Times, 2008). 22As time went on, however, helicopters and four-wheel drive vehicles were used to determine how people were coping. Where helicopters landed on farms these visits were greatly appreciated and the desire for some face-to-face, physical contact was repeatedly identified by farm families as a primary need. However, others found out later that Civil Defence had in fact flown over their property, seen movement, and ticked them off as OK, not improving popular perceptions of the support provided. As one farmer noted: “how could Civil Defence possibly tell from a helicopter what problems were happening on the farm or in the home?” (Extensive sheep farmer). 23Civil Defence supplied hot meals and showers to families and used local pubs and camping grounds as centres for such support activities. With communication links down, however, some households remained unaware of what was available. Those who were aware and took advantage were grateful. Initially farmers were often reluctant to accept such help, but later were seen at the centres with their families. Food parcels, which included books, games and magazines for both children and adults, were also distributed throughout the region. 24Other assistance came through Taskforce Green, a government programme that allows people to develop work habits and job skills. Workers funded under this programme were used mainly to remove fallen trees and branches and repair fences damaged in the storm. For those farmers who took advantage of this, there was almost unanimous enthusiasm for the service provided (11/12). 25Most anger was directed at the failure of the telecommunications system: “what happened with the phones never should have occurred, especially not in this day and age with the technology we now have” (Extensive sheep/beef/deer farmer). 26Blame was largely directed at the supply company (Telecom). There was widespread belief that the company had let them down and should be held accountable. This was summed-up in the statement that: “farmers are expected to invest in being prepared, but Telecom isn’t. They are too profit driven. They don’t get a return on their investment in rural preparedness” (Dairy farmer). 27Self-sufficiency, they argued, required the maintenance of basic infrastructure: “farmers are expected to be self-sufficient. We can only be independent or self-sufficient if essential services are operating” (Sheep/beef/deer farmer). 28Farmers viewed cell phone coverage as central to their infrastructural needs. Privatised in 1990, there was also a belief that the collapse of phone services would not have happened in the past, and that it remained a government responsibility to ensure service provision. 29Different types of farms, variable terrain, the location of farms and distance from town, meant that the snowstorm had a unique impact on each household. However, common themes included anger at the loss of communications and power, road closures, stress from the damage experienced, problems feeding stock, and frustration at the duration of the snow cover. Nevertheless, the resultant impact on economic production and stress levels showed a clear differentiation between those farms in the High Country and those on the plains. 30In the mountain and upland areas, customary local practice is to get stock down off the higher grazing areas in April. When the storm hit, some farmers still had stock on these higher areas. A dry summer and autumn had provided poor grazing. Despite the risks and in an effort to increase their profits (or achieve profitability) officials and farmers suggested that some had extended the grazing period on what were essentially summer pastures. As one farmer explained: “bad management, exacerbated by the dry autumn, meant some farmers pushed things to the limit” (Sheep/beef farmer). 31There are no official data on regional stock losses, and fewer than half those interviewed had experienced any stock losses (13/32); mainly sheep, but deer also fared particularly badly, especially when the frosts set in. Although over-all losses are accepted as significantly lower than in many earlier snowstorms, those that occurred highlight the extent to which farmers may, in tight economic circumstances, take exceptional risks. In 2006, sheep and wool farmers had experienced almost 20 years of weak demand and poor prices. In an economy uniquely exposed to global market pressures and without farm subsidies or much other government support (Smith and Montgomery, 2004), there is a risk that environmental boundaries may be exceeded. And this happened here. 32Physically marginalised, farmers in the High Country overall were better prepared, less vulnerable and more resilient than many of their counterparts in lower lying, less physically marginal areas. This may be explained by the fact that farmers in the higher areas commonly had more experience of snow and a greater expectation of severe storms than farmers on lower areas. Evidence from this research suggests that the relative vulnerability and resilience of the two groups also is linked to differences in farm structure and technological dependence. 33Only one third of the sample farms had any resident paid labour. Of the 7, large, high country runs, however, 6 did have resident employees. Much farm work, including fencing and shearing is now done by contract labour, hired on a short-term basis. This contrasts to a few decades ago. At the same time, farm technology and farm practices have changed. On the plains, smaller farms have adopted intensive land use practices and substituted capital for labour to maintain their viability, a trend commonly evident in New Zealand as elsewhere (Smith et al., 2010). Today hay and silage bails are too big to handle without mechanical equipment or additional labour; and feeding out in snow, may be impossible if dependent on mechanised equipment which fails and no labour is available. Rescuing sheep from snow requires extra physical labour. In these circumstances, a phone is almost the sole means to signal and obtain help. A tool which provides increased resilience in adverse circumstances such as a medical emergency, fire, or drought, exposes a new dependency and increased vulnerability when in a snowstorm the service fails. 34For those farm households with coverage, cell phones are now an integral part of life both in a social context and as business tools. With phone services down, farmers noted the stress of being unable to maintain daily contact with scattered family members, particularly with children away at school or university, or with elderly parents living off the farm. 35Framers in the High Country commonly have no cell phone coverage, or coverage is patchy. Consequently, some have retained radio communication equipment that allowed them to access help. As noted, some larger runs in particular still have residential workers. Perhaps more importantly, conscious of the risk of snowstorms, all such properties had the resources in place to manage such situations (7/7). In effect, the marginalisation and risk long associated with mountain environments (e.g. Nicholson, 1963) was in this New Zealand example, significantly modified by the size of the properties and the range of equipment and other resources they retain. This is further impacted by the extent to which these farms are prepared for hazards, and their heightened awareness that in the face of such events, the capacity to respond without external help is essential. 36The differential impact of the snowstorm on High Country farms and those on the plains extends to the nature of the support they expected and required. On the smaller lowland farms, there was a common acceptance of the need for counselling to relieve the stress the storm induced. Farmers on larger High Country properties often dismissed counselling as a waste of tax-payers’ money, prioritising direct economic support (often in the form of free or subsidised stock feed). 37Farm households in South Canterbury, and particularly in the High Country, are on a daily basis faced with issues of isolation and few close neighbours. Modern technology and communications have minimised these problems. When a hazard occurs, however, as this paper has shown, for some such disadvantages may be reasserted and even heightened. 38In the most physically marginal areas, properties are generally larger, well established and much better attuned to the prospect of snow. Typically they have greater financial resources, a resident labour force, the necessary equipment to cope, and well developed, long-established community links. They are also less dependent on cell phones. These characteristics provided a powerful buffer against the most serious consequences of the snowstorm. 39Indeed, the snowstorm exposed the particular vulnerability of the lowland farmers. This is explained by their lack of experience and low expectation of a major storm and consequent lack of preparedness, their particular dependence on modern technological aids, lack of ready access additional labour, and intensive (technologically dependent) farm systems. These factors directly impacted on their ability to respond to the pressures imposed on their farm business and on their family by the storm. For many these pressures were compounded by financial constraints. The result was high levels of psychological stress and long-term economic costs. 40Recent decades have transformed the structure and coherence of rural communities in modern industrial economies. These include new agricultural practices, a loss of farm labour due to technological change, and improved communication networks. In New Zealand these changes have been accompanied by a withdrawal of farm subsidies leaving the farm population particularly exposed to economic and market forces. As shown here, the result includes new dependencies and new vulnerabilities that were exposed in the face of a major hazardous event. Despite the physically marginal environment in which High Country farmers live and work, the evidence presented here suggests that they have achieved and maintain a dynamic social resilience in balance with that environment, a balance less fully developed in more intensive farm systems in less physically marginal areas. Bankoff G., 2002. – Cultures of disaster : society and natural hazards in the Philippines, Routledge, Londres. Blaikie P., Cannon T., Davis I., Wisner B., 1994. – At risk : natural hazards, people’s vulnerability, and disasters, Routledge, Londres. Burrows C.J., 1976. « Exceptional snowstorms in the South Island High Country ». Tussock Grasslands and Mountain Lands Institute Review, Vol. 32, pp 43-47. Civil Defence Canterbury, n.d. – Don’t forget your four legged friends when preparing for an emergency, Civil Defence Canterbury, Christchurch. Glaser G., Strauss A.L., 1967. – The discovery of grounded theory : strategies for qualitative research, Aldine, Chicago. Hatch E., 1992. – Respectable lives : social standing in rural New Zealand, University of California Press, Berkeley. Hendrikx J., 2007. – « The June 2006 Canterbury snowstorm ». Journal of Hydrology (NZ), Vol. 46, n°1, pp 33-49. Jeanneret F., Wanner H., Owens I., 2001. – « The Alps in Europe and the Southern Alps in New Zealand ». Mountain Research and Development, Vol. 21, n°4. Metherell A.K., 1997. – Soil Nutrient Budgets. Nutrient Management. Undeveloped High Country. Rapport pour le Canterbury Regional Council, AgResearch, Hamilton. New Zealand Herald, 2006. – « Civil Defence hits back over handling of storm ». New Zealand Herald, 20 juin. Nicholson M.H., 1963. – Mountain gloom and mountain glory, Norton, New York. Otago Daily Times, 2008. – « Timaru still learning lessons from the “Big Snow” of 2006 ». Otago Daily Times, 8 septembre. Pearce L., 2003. – « Disaster management and community planning, and public participation : how to achieve sustainable hazard mitigation ». Natural Hazards, Vol. 28, n°2-3, pp 211-228. Smith W., Davies-Colley C., Mackay A., Bankoff G., 2011. 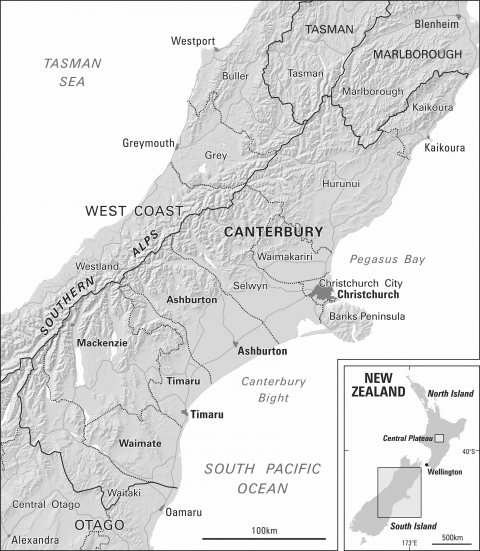 – « Social impact of the 2004 Manawatu floods and the ‘hollowing out’ of rural New Zealand ». Disasters, Vol. 35, n°3, pp 540-553. Smith P., Gregory P.J., van Vuuren D., Obersteiner M., Havlik P., Rounsevell M., Woods J., Elke S., Bellarby J., 2010. – « Competition for land ». Philosophical Transactions of the Royal Society B, Vol. 365, n°1554, pp 2941-2957. Smith W., 2007. – The resilience and response of farm households in the aftermath of the 2006 Canterbury snow storm, Ministry of Agriculture and Forestry, Wellington. Smith W., Montgomery, H., 2004. – « Revolution or evolution ? New Zealand agriculture since 1984 ». Geojournal, Vol. 59, n°2, pp 107-118. Swaffield S., Hughey K., 2001. – « The South Island High Country of New Zealand ». Mountain Research and Development, Vol. 21, n°4, pp 320-326. Wilson T.M., Paton D., Johnston D.M., Houghton, R., 2009. – Impacts and emergency responses to the 12 June 2006 South Island snowstorm, GNS Science Report 2008/40, GNS Science, Wellington.